The story of GreenDustries starts with a sloppy hamburger and ends with an ingenious idea to revolutionize packaging in the fast food industry. What happened was this: Founder Akiva Buchberg, an investment banker in Paris, dressed smartly for business, was heading to a meeting in the early 1990s. Hungry, he decided, along with his compatriots, to have lunch at a sidewalk café and ordered a hamburger. He took his first bite and the burger’s contents dripped all over his expensive suit. He lamented to his friends at the table, “There’s got to be a better way to eat a hamburger,” and mulled the idea further while he sat at the meeting with his briefcase covering the stain. Shortly after he contacted an engineer, Gilbert Capy, who developed the concept of what would be GreenDustries’ landmark product design: a simple piece of pleated paper that would cover the entire burger and be pushed back with every bite, securing the burger and allowing the person to enjoy their meal without fear of it toppling into their lap. With this in hand, Buchberg decided to bring his new business idea to the United States, where fast food and the hamburger had achieved iconic status. His goal was to change the way Americans eat fast food. But fast food had to catch up with him. The problem was that in the early 1990s the industry was trying to reduce its costs on the packaging industry and the product was put on the shelf. 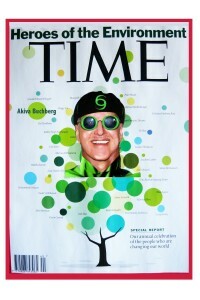 Twenty years later Buchberg brings his concept back to market for several reasons, and in the nick of time. 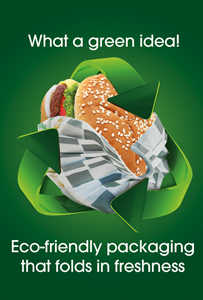 An industry that innovated the way in which a nation eats fast food has fallen short in the area of innovation, offering what the consumer wants in packaging and with environmental responsibility! In fact, little has been done to a hamburger box and wrapping paper since the early days of fast food. What GreenDustries brings in the way of innovation are products both different and practical, particularly for fast food, whose companies continually look for ways to distinguish their business in a saturated industry. There’s no better way than packaging, and by using GreenDustries PleatPak™ and Magic Bag™ products, they not only set themselves apart, they get a product that is both aesthetically and functionally different. All in all, a much greener way to do business. Hi, can you explain more? Thank you!